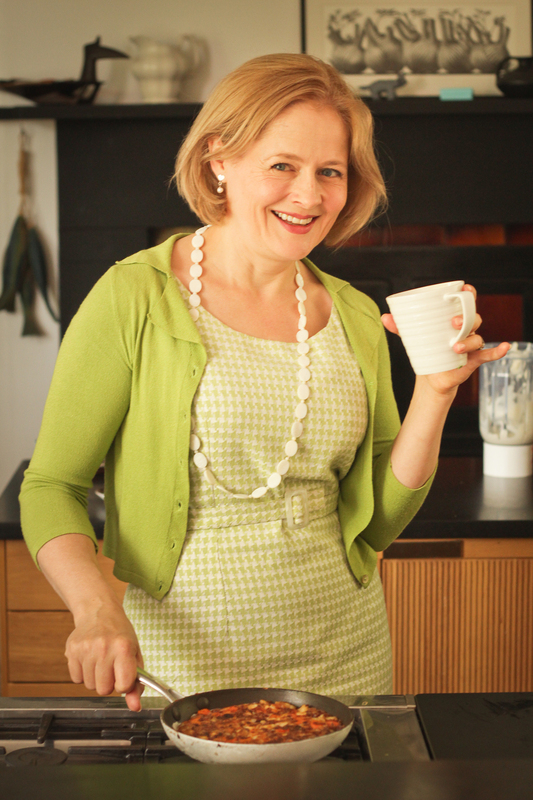 Published author, Leiths-trained chef and long-established food and cookery writer for The Telegraph. A slow cooked veg delight that is excellent reheated for breakfast if you have any left over. I like to use the drippings from the week-before’s roast – beef, lamb, pork or chicken, they really do improve the flavour – but oil works fine too. It saves time and trouble to cook extra veg, so there is enough to make a soothing soup for supper too. It uses all the vegetable water as stock, so nothing is wasted. 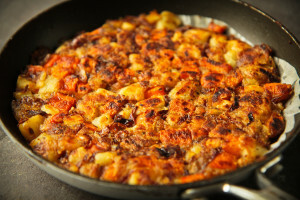 If you like the idea, just double the quantity of carrot, potato and parsnip, and prepare and boil them all together. Divide the mixture in two and keep half in the fridge, along with the cooking water, until you want to make the soup – the recipe is below. 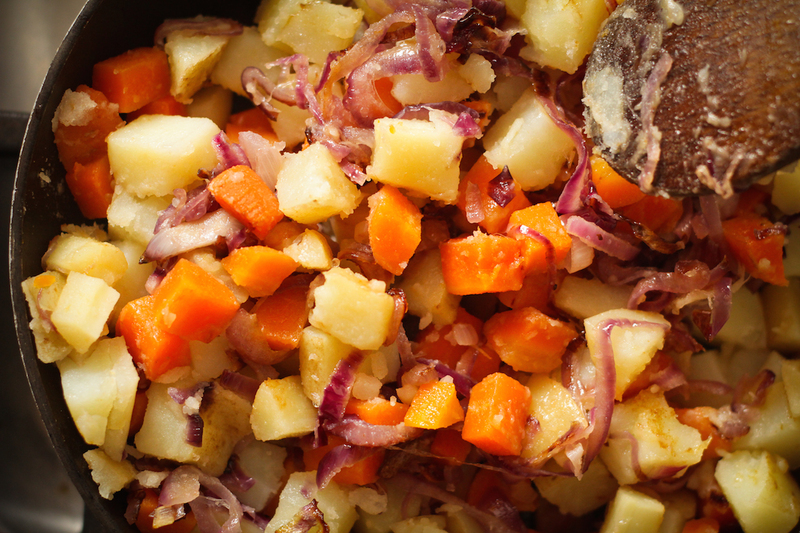 Cut the carrots, parsnips and potatoes in 1cm cubes – no need to peel them. 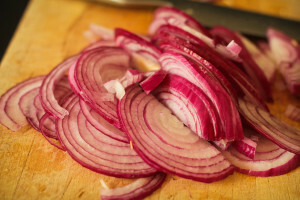 Peel and slice the red onion. Heat 1tbsp dripping or oil in a small non-stick frying pan (one around 18-20cm across the base) and add the onion. Cook until tender and golden. Crush in the garlic and cook for a minute more. Meanwhile, bring 1l of water to the boil with 1/2tsp salt in a large pan. Add the veg and bay leaves and bring back to the boil. Boil for 7-10 minutes until the potatoes are tender. Press the veg down very firmly so it forms a round cake in the frying pan. I find it helps to lay a sheet of non-stick baking parchment over the top and then tamp down the mix with a smaller, flat bottomed pan. Turn the heat down very low and leave the hash to mutter gently for 20minutes or so, until golden underneath. Slide on to a plate. Add some more dripping or oil to the pan, heat, then invert the hash back into the pan. Press down again, and cook for another 20 minutes or until nicely golden and crusted. Serve with poached eggs and steamed spring cabbage or broccoli. ** if your frying pan is not as non-stick as it might be, then at this point scrape the mixture into a bowl. 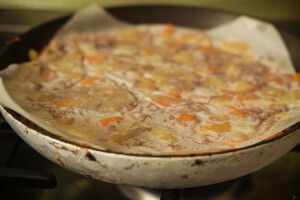 Then put a circle of non-stick parchment, and a dab of oil or dripping, in the bottom of the frying pan. Heat until the fat melts, then tip the veg back in the pan and continue as above. 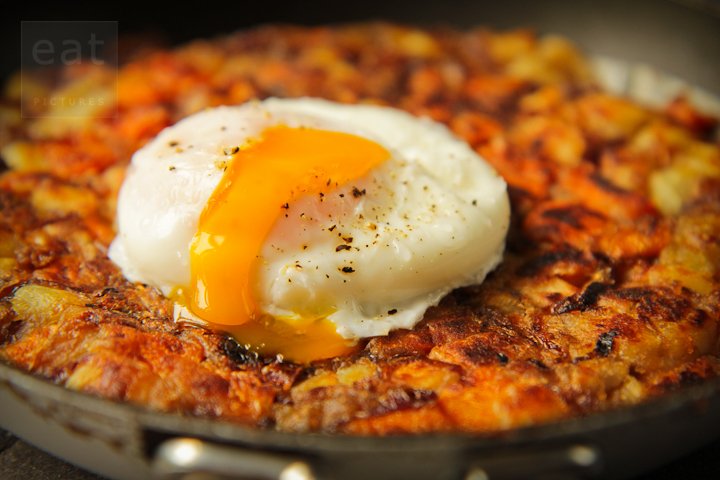 It won’t burn, and the hash will turn out beautifully. TIP: with any slow cooked dish like this, every now and then twitch the handle of the pan to shift the position slightly. Even the best pan won’t spread the heat completely evenly, so this way you’ll avoid hot spots, and so burnt patches forming. Natures Premium is part of Produce World Group Ltd.
Produce World Group Ltd is registered in England. © Produce World Group Ltd 2019. All Rights Reserved.